Yasou Mykonos offers a flavorful variety of Mediterranean cuisine made to perfection as well as a beautiful relaxed environment, inside and out. With our open kitchen you may see the exquisite skills of our chefs as they diligently prepare the finest quality meal for you. 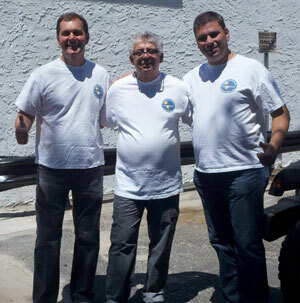 With fine dining and friendly staff we are here to give to the community for many years to come. Our homemade specialties are sure to have you coming back for more. Our fresh ingredients offer not only a lovely flavor but also a healthy alternative to your daily diet. I had high hopes for a Greek restaurant closer to my home and was not let down at all. After traveling to Greek Village for years it's so nice to have a great place so close by! Everyone from the owner, waiter and cooks were very nice and went out of their way to make sure we were satisfied. Fantastic meal. Had chicken gyro, lamb/beef platter, fried calamari. Both types of gyro meat were actually recognizable as meat and very flavorful. They put actual cuts of meat on the vertical spit, not the cylindrical mystery meat that most places use. The calamari had a delicious delicate batter and was cooked just right. No rubbery squid here thankfully. Rice pudding was flavored nicely and not too sweet. Comes out as a bit of a cake, not soupy. Very nice. Decor is fresh and clean. Nice job. 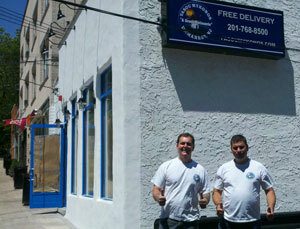 I have been looking for a laid-back place for great Greek food near Tenafly. This is my goto place now. July 4th at 7:00pm. Just found out about this place. Ordered 2 chicken souvlaki, spanakopita, and Spanaki to go for $54.00. The food was good even though they left out the tsatziki sauce :( I thought the decor was nice and so were the folks working there. byob. Will definitely go back to eat in. Yasou Mykonos is fantastic! The food, decor, and service all combine to make you feel like you're sitting at an outdoor taverna in the Aegean. 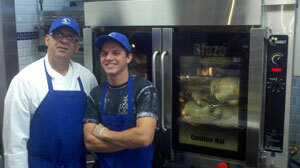 The owner Chris instantly makes you feel welcome with good-natured banter, and the waitstaff is attentive and friendly. Chef Giannis' menu features delicious dishes such as the htapodi and the rotisserie chicken, however, the cold apps and salads are not to be dismissed! The whitewashed walls, flagstone flooring, blue trim, and flowery arbors all invoke the Aegean. Plus, this light, airy decor looks out onto beautiful Demarest center with the green, the lake, and the train station. Everything about Yasou Mykonos makes it worth establishing it as a regular dining destination. Went on a Saturday night the place wasn't that busy so there was no wait. I read some of the reviews below I have no idea what these people are talking about. In fact some of the foods that these people were talking about in their review aren't even on the menu. I split a half a roasted chicken with my wife we shared a large Greek salad and some special dips for the appetizer. The chicken was moist and juicy and absolutely delicious. The Greek salad had fresh homemade feta cheese and there was enough to share for the two of us. the dressing was light lemony and tasty. The waiter was very knowledgeable and attentive service was great. I almost don't want to give this place five stars because then I know next Saturday night when I go I'll show up to a packed house. As picky as I am, I highly recommend this place. For a local joint the food is excellent. And for those that are from out-of-town it's worth the drive! Decor was beautiful, the chicken pita gyro is out of this world, service was amazing, I have been going there for the past 2 months and it has yet to let me down. I have been to Yasou once; my husband and my children twice. They loved it both times. I really enjoyed it my one time. We had calamari (tasty and light), large Greek salad (delish and enough for an army), 2 lamb gyros, (again, extremely tasty and huge portion), chicken souvlaki (lovely seasoning, tender but not undercooked), beef souvlaki (tasty), kids chicken bites (nice to see real chicken) and Greek yogurt with honey and cherries for dessert (I am still dreaming about that yogurt it was sooooo good). Have not done takeout, but eat-in was wonderful. Owner was extremely friendly, as were servers. Try it yourself! Let me preface my remarks by saying that we are huge devotees of Greek food. Sadly, in Bergen county we have been limited to only a few moderately acceptable choices, and not at great prices. Until now. Yasou Mykonos is a little slice of Mediterranean heaven. The atmosphere is fresh and clean, with the requisite blue and white, a little nook torn straight out of the Greek Isles. The owner's obsession with natural and fresh ingredients is reflected in virtually everything they do. Their yogurt, so vital in the Greeek diet, is marvelously fresh, tangy and dense. Thus, their fantastic Tsasiki is quite unlike anything elsewhere - not at all "wet" or "watery" - and simply exploding with flavor. Their various Pita sandwiches, the Gyros and Souvlakis, are taste sensations. Loaded with juicy chunks of meat, wonderfully fresh tomato, that great Tsasiki, onions, and the restaurant's very special french fries, these sandwiches are juicy, filling, and explode with flavor. 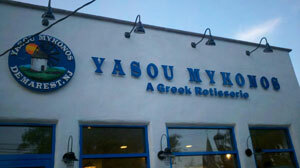 We've been to Yasou Mykonos at least 10 times, and we've never had a bad one. And between me, the wife and the two kids, we order a variety of them. But I want to single out one thing on their menu that is beyond description good. Their rotisserie chicken. This is no ordinary bird. Again, the quality-obsessed owner buys -massive- ones, the largest I've ever seen. The simple seasonings are sprinkled on, and then the chickens are placed on skewers in a special imported-from-Canada rotisserie with a steam tray in the bottom, ensuring moistness and crispiness, all at the same time. Folks, my wife and I are from Montreal, where chicken is a mainstay and there are at least 100 chicken restaurants serving the city. We grew up on rotisserie chicken as a twice-weekly staple. Yasou Mykonos' chicken surpasses anything we've had, anywhere. It is simply -that- good. We often swing by, buy a couple and bring them home for dinner, saving the leftovers. His salads are lovely affairs - his Greek Salad is very generous and wonderfully fresh. The large is -large- to be sure. And again, his focus on freshness and quality ingredients stand out. We've not sampled many of the main courses, so I can't readily comment on those. We've limited ourselves to sandwiches, the amazing rotisserie chicken, and some side dishes. As for dessert: Their yogurt is the house specialty and we recommend it with the honey. They have a sour cherry sauce, and could/should be more generous with the cherries and the sauce. You tend to run out of it to quickly - and coupled with the tangy yogurt, it will challenge some palates. The other specialty - again, an all natural concoction, is out-of-this-world rice pudding. Quite simply the best we've had in ages. I've read some reviews below and frankly I suspect they may be the musings of folks who little appreciate what this owner has accomplished. I have no idea how anyone could compare this restaurant to Greek Village or It's Greek to Me - not only in terms of hospitality, but culinary style. The management at Yasou Mykonos has legitimately created a little BYOB gem. The wait staff is lovely - bright young men, eager to please and enthusiastic about the cuisine. The kitchen, early on, had spasms - sometimes it could be very slow during busy take-out hours - but this seems to have largely been rectified of late. Yasou Mikonos is readily accessible from many points throughout northern Bergen County, and parking is never a problem. A final word: The prices. Everything is spot-on-reasonable, and a well-ordered dinner will never ding your wallet. I recommend this restaurant highly, as does the rest of my family.